What colour jumps out at you when you open your wardrobe? Do you buy one particular colour each time you go shopping? Do you like flowers, stripes or animal prints? I love many colours but my favourites have to be grey, black and white. I think they look well together and can be worn at any time of the year. Black and white stripes, stars, or spots, I just can’t get enough. I love my Monochrome wardrobe and I love how easy it is to put items together. You don’t need a lot of clothes to make it work. A few nice simple pieces can take you out to a casual meal or to an important meeting. Here are a few examples of how a monochrome wardrobe works for me. Putting things together is so much easier. It is so easy to match clothes. Turned up white jeans in the summer with a black and white striped top or pair black jeans with a loose white shirt and vest top for a very classy look. Switch to a striped oversized jumper with same black jeans in the colder months. An all white or all black outfit depending on the weather will always look well. A nice light neck scarf (stripes, hearts) will finish off your outfit very nicely. A two tone dress is a lovely idea wearing the stronger colour down lower. I have a few lovely black and white dresses but one in particular has the black at the lower end which really gives a slimming look and can be worn all year round.Break the outfit up by putting stripes in the top half for a softer look. 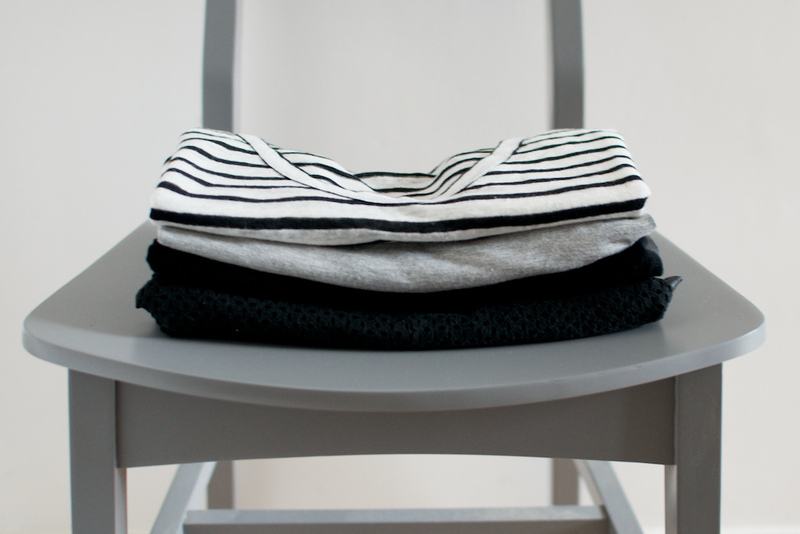 I have a lot of stripe tops (navy and white and black and white) that can be worn all year round. Heavy striped jumpers or loose light t-shirts will bring you out for dinner worn with heels or for a casual lunch worn with a pair of flats. If you don’t have a big budget to spend on clothes. You all know by now how much I love a bargain and that I don’t spend a lot of money on clothes so a monochrome wardrobe will definitely get you over that month when your waiting for pay day. You can wear these pieces time after time without them going out of style. These pieces are definitely timeless. If you get tired of wearing them fold them and put them away. Believe me you will be putting them back in your wardrobe before long. Accessorising monochrome items is easy. Simple long necklaces over a plain t-shirt or loose scarf, knotted on a cold day looks very smart and easy to wear. So what are my 5 favourite monochrome pieces? So what colours dominate your wardrobe. Have you lots of plaid shirts or colourful tops? Do you like stripes, spots or hearts. Organise your clothes so that you can mix and match a few simple tops with plain jeans or skirt. Remember always leave your clothes out the night before so you can hit the day running.